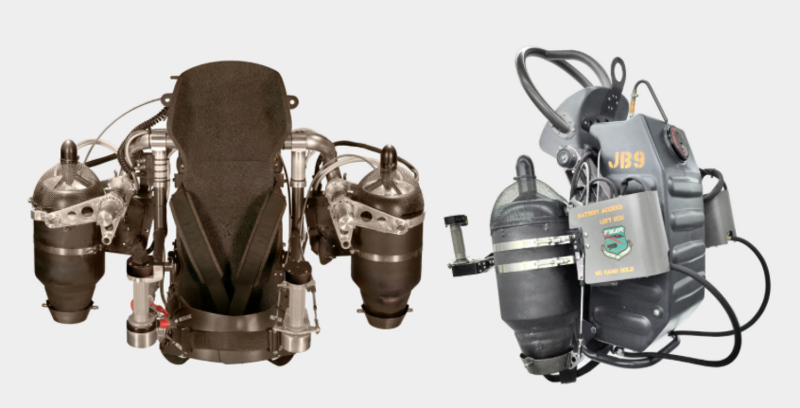 Sciblogs | The personal jetpack – who will get there first? The personal jetpack – who will get there first? 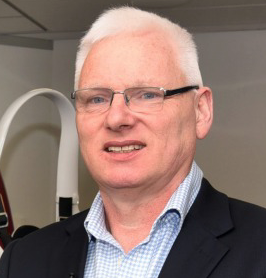 It has been a rollercoaster of a year for Martin Jetpack, the innovative Christchurch company that for years has been chipping away on developing a “practical” personal jetpack. In June, the company’s founder, Glenn Martin, abruptly quit, seemingly dismayed at the direction the company that bears his name was going in. You see, Martin’s original vision, over 35 years ago, was for a personal jetpack – sort of like the one worn by daring rocket man Bill Suitor, who in spectacular fashion, flew it into the stadium at the 1984 Los Angeles Olympic Games. What Martin ended up developing over the course of 35 years wasn’t really a jetpack at all, but a ultra-light aircraft with ducted fans for lift rather than being propelled by jets of escaping gases like earlier attempts were. That allowed development of a device that could stay in the air longer, was much more stable and which could carry loads as well. In many respects, it was really a slimmed down replacement for a helicopter. He wanted it to revolutionise personal transport – and recreation. But as investors came onboard and Martin Jetpack became, in the words of its founder, a “corporate beast”, it became clear that the management and shareholders saw better commercial potential for the Martin Jetpack in niche roles – the military, search and rescue and first responder emergency crews. Martin Jetpack, which is listed on the Australian Stock Exchange, ranked the personal jetpack much lower on its list of priorities. But the board’s strategy appears to be paying off. 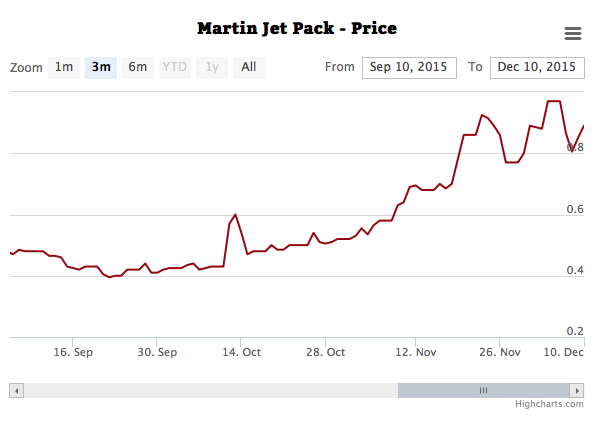 This week Martin Jetpack’s share price hit an all time high following its successful manned demonstration flight of its latest model the P12 at Shenzhen in China. It apparently has provisional orders for 100 Martin Jetpacks via a Chinese partner company and shareholder and for 20 more manned and unmanned Jetpacks (it can also be remotely controlled) with the Dubai Civil Defence. 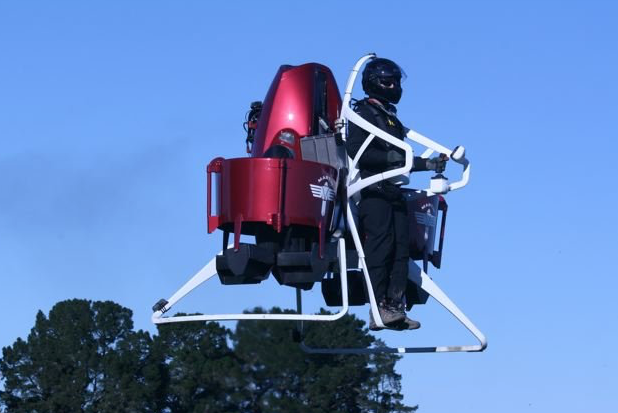 The Martin Jetpack, which can fly for up to 30 minutes at a maximum speed of 74km/h and an altitude of up to 1000 metres, will sell for US$250,000 and be ready to ship in the second half of next year. But Martin Jetpack is still going after the personal jetpack market – at least, it claims to be. It is currently taking US$5,000 deposits for a recreational version of the jetpack that will be ready by 2017 and cost US$150,000 plus delivery, taxes and duties. Maybe if Martin had had more patience, he could have been around at the company to see his dream of the personal jetpack realised. But in terms of the true jetpack we imagine when we hear the term, there are other players likely to get there first – and perhaps dominate the personal jetpack market in a way Glenn Martin dreamed of. Last month Jetpack Aviation undertook a flight of the JB-9, the world’s “only true jetpack” over the water off Manhattan Island. The JB-9 is a genuine jetpack, worn on the back. It’s development as a longterm passion project of Australian businessman David Mayman, has close parallels with Glenn Martin’s story. But Martin must now be watching on with envy as Mayman gears up to deliver the type of personal jetpack his fellow inventor dreamed of. The JB-9 basically straps two jet turbine engines to a backpack which also houses a 38 litre fuel tank that allows around 10 minutes of flying time, give or take depending on the weight of the pilot. Jetpack Aviation has some impressive videos of test flights on its website – the JB-9 offers speed (over 100 km/ph) and maneouverability that make it an adrenaline junkie’s dream toy. The site is light on technical details, but it is clear that Jetpack Aviation have some work to do before it is ready for prime time – including safety features like a ballistic parachute for emergencies and a fully “hands-off” stabilised flying system. Interestingly, and Martin Jetpack will be watching closely here, Jetpack Aviation is pursuing development of a four engine model which would greatly boost the power and therefore carrying capacity of the jetpack therefore making it useful for the types of customers the Martin Jetpack currently appeals to. No word as to how much the JB-9 or its successor the JB-10 could cost. …enormous, about as portable as a piano, and you can’t strap it to your back and walk anywhere. Is Martin Jetpack really more stable? I know which pack I’d rather be in in big winds, well moderate winds! Is it really safer yet?- clearly they don’t have it sorted because their demonstrations are still over water too! If they have a parachute on board can they still carry the load they claim? Doesn’t look very developed? Then there’s the Memorandum of understanding with Dubai with Dubai – which somehow the press turns into a contract? Then there’s, promising your own product to yourself, your largest shareholder in China & that is newsworthy because? As for Glenn Martin having patience – Glenn Martin said he would leave if he could see that MJP wouldn’t make a jetpack…well he did.